Poet and graphic artist Peter Lyssiotis writes in his introduction to Lost in Mid-Verse, “Costi’s verse has been written when the movement of people from one country to another is probably the defining characteristic of the time.” Emigration is the central event of the book, and Costi’s poetry is worked in specific temporal and cultural detail, but as Lyssiotis hints, her themes of rupture and continuity, of the pains and freedoms that come from hiatus, have broad relevance. This chapbook is one in a series from Owl Publishing, established by Helen Nickas to publish the work of Greek-Australian writers, a nomenclature that here includes Cypriot-Greek. 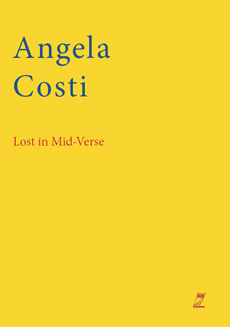 Angela Costi’s Lost in Mid-Verse contains just seven poems, but each poem branches into recollection and reference to family and history with enough thoughtfulness and depth to make the chapbook a satisfying read that includes memorable images, phrases and ideas. The first poem, ‘Sugared Almonds’ is visually as small, symmetrical and compact as the familiar but significant confectionary, a traditional wedding favour, for which it is named. In this poem, Costi makes the most of the possibilities of enjambement, using the words at the beginning and the end of lines almost like waymarkers, while retaining the pleasing, natural and speechlike patterns of each line’s rhythm. The poem describes the practice of sleeping with sugared almonds under one’s pillow and dreaming of one’s husband-to-be. Those future husbands appear in the poem, “coated in frightened white”. Thoughout Lost in Mid-Verse, husbands, fathers, uncles, grandfathers are faint presences, sometimes opressive, but marginal, dependant for their existence on the women at the centre of the experiences in these poems. In ‘Sugared Almonds’, possible husbands are overshadowed by the great-grandmothers who have passed on the almonds in the first place, symbolically inducting their grandaughters into “games of caress / hide and seek among fingers and / sheets.” The poem about sweetened seeds is a kind of conception, a beginning for the themes of matrilineal language, intimacy, inheritance, connection and hiatus, that are to come in the next six, longer, poems. There is a narrative to be read in these poems. The reader could approach them as stories of generational experience, of great-grandmothers, grandmothers, mothers, daughters, and granddaughters. However, narrative and chronology is not the most important organising factor in this collection. All of the poems deal with continuity and rupture experienced in different ways, most often through migration, but also, as in the poem ‘Gate’ through the experience of the neoliberal institutions of care compared to care in the context of family and kinship ties. In ‘The Question’, a woman lives the rupture between the old place and the new. Objects in her home show that her role within her family, her marriage, her religion and culture is both meaningful and burdensome. Photographs of female ancestral figures, the “nun and her battered suitcase”, and “the virgin bride and her heavy glory box” emphasise tradition as burden, but the company of a real life neighbour cannot compare with the company of these foremothers who cannot see the wattle and magpies of the new place, only the mouflon (wild sheep) and “drooping carobs dripping with their nectar” of Cyprus. The woman in this poem secretly plants a bottlebrush in her garden at night. Digging to plant the sapling, the woman discovers that the soil holds “no blood, the roots of trees don’t weep.” This absence is another expression of the double experience of loss and liberation, although perhaps the crimson of the flowering bottlebrush is a dormant image of blood associated with the new place. The poem ‘Mothers’ describes the way one generation connects to the next, through breast and mouth in the feeding of infants, and through language, the mother-tongue, in song and speech. The context for all this is love, both wild and serene. Costi describes the strange undulating presence and disappearance that can be part of mothering, to experience oneself as a self but also as a part of a continuity of women feeding and fed, comforting and being comforted, teaching and learning. Interwoven with the physicality of this experience is the imaginative space that is opened up as a part of the work of caring for infants, nurturing them and inculcating them into their linguistic and cultural heritage. Passing on songs and stories, reading, dreaming, and singing again, old stories and new imaginings. Costi makes the image of the apricot the centre of the final poem in the collection, ‘Golden Apple’. The poem opens with a reference to the Classical myth of Atalanta, a famously fast runner, reluctant to marry, who challenged would-be suitors to a race. The man who eventually outran – and married – her, Melanion, received a gift of three ‘golden apples’ from Aphrodite, and by throwing these at the feet of Atalanta he slowed her down enough to win the race. Costi argues in the poem that Aphrodite’s three irresistible fruits were apricots, “smaller than apple / sun-licked … soft and firm – Cupid’s bottom.” Aphrodite’s fruit, the fruit grown, in Ovid’s version of the myth “in a field upon Cyprus, known as Tamasus”, also grows in the poet’s backyard, “challenging / the lemon tree to an annual race”. Costi’s final image of the apricot, transformed by cooking and served on a crystal plate, has the power to briefly interrupt the past. In the act of eating the skilfully prepared and beautifully presented apricot, Costi’s recurrent images of mouth, breast, language, and land are unified, and culture and nature, myth and mundanity, past and present, are briefly, temporarily, brought into wholeness.